This is a great story, and thanks again to Pat for sharing it. During a spring training broadcast this year, Pat & Ron were discussing the April schedule and Pat noted the Cubs have a trip to New York coming in the middle of the month. Ron said at the time that he wished it were later in the season (because he usually takes a road trip or two off mid/late season to tend to his health and rest up). But Ron said begrudgedly at that time that he would make this trip. Well the road trip begins tonight at Citi Field but will go on with no Santo. Dave Van Dyke reports that Ronnie won’t be going after all. And it seems Santo doesn’t seem to mind too much. 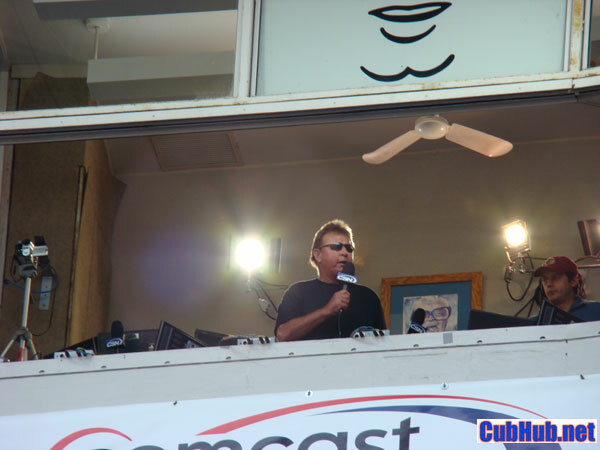 Ron Santo takes a lot of heat for being less a color analyst than die-hard fan in the booth. But despite his analyitcal shortcomings, he is fun to listen to. Subbing for him on this trip will be Keith Moreland. Zonk did some Cubs broadcasts last year and really sounded good – even with his sometimes ‘aw shucks’ approach. Maybe we are glimpsing Santo’s eventual replacement? I heard some of yesterday’s Cubs radio broadcast and I have to say, Ron did not sound good. His speech was slow and he seemed confused. Not the lovable confusion and befuddlement that is his trademark, but obvious to me is was not feeling well. Get well soon, Ronnie..
Hysterical. Only Ron Santo could set his own hair afire in the ballpark and city he hates most. Thanks for posting.